The Hillsborough County Fair will be in town Wednesday-Sunday, October 12-17, offering fun activities such as a midway and the Hale Bay decorating contest sponsored by the Florida Strawberry Growers Association. Fall is approaching and that means the 18th Annual Greater Hillsborough County Fair is just around the corner. This year’s event will be held Wednesday-Sunday, October 12-16 at the County Fairgrounds on S.R. 60, just east of Brandon marked by the Mosaic donated dragline bucket. The Hillsborough County Fair opens Wednesday, October 12, so gear up for five fun-filled days of competitions, fair foods such as funnel cakes, kettle corn and corn dogs, midway rides and more. From Recycled Yard Art Competition to Hay Bale Decorating, there will be creative sights to see and to taste. The Rotary Club of Bloomingdale/ FishHawk will hosts its annual Chili Cook-Off on Sunday, October 16. The Hillsborough County 4-H Foundation will hold a barbecue dinner on Saturday, October 15. There will be plenty of traditional fair food, including the newly-added deep fried Oreo cookies and Snickers bars. Speaking of Oreo cookies, Robinson’s Racing Pigs are back this year to race for first place and an Oreo cookie. The fair hosts Youth Livestock Shows and animals large and small can participate. Dairy and beef animals are housed in one tent and sheep, goats and swine and a large rabbit and poultry are housed in adjoining tents. Fairgoers are encouraged to walk through the tents and visit with exhibitors and learn first-hand the skills of animal husbandry. Many fair competitions are open to residents of all ages. Kids can enter the “Just For Kids” area and adult entries will be on display in photography, craft works, quilting, needlework, sewing, handicraft and other areas of competition in Family Living Arts and Crafts. Those with an artistic talent can enter their work in the visual or decorative arts area and those with a green thumb may find their plant wins the Best of Show in the Horticulture Show. The Ranch Rodeo will bring in a crowd on Friday and Saturday nights at 7 p.m. as ranch hands compete for cash prizes as they team up in events like Wild Cow Milking, Bronco Riding, Mutton Busting and more. Purchase a rodeo ticket in advance from one of many area merchants provides free admission to the fair. Also in the arena bleachers on Saturday will be the Bay Area Bandits Mounted Shooting Club. New and featured in the arena on Wednesday evening, October 12, is the Youth Bull Whip Cracking Contest. The antique tractor, engine and equipment area has been added this year. Arnold Amusements will provide the thrills of a midway with rides for all ages. Wristbands and single tickets are offered each day. Thursday’s wristband special is $15 to ride all the rides. On opening day, October 12, Arnold Amusements has agreed to offer any ride for $1. The 14th Annual County Fair Teenage Battle of the Bands will take place on Saturday, October 15, from 12 Noon-11 p.m. The Harvest Queen pageant will be held on Saturday, October 8, before the fair begins. Harvest Queen and Junior Harvest Queen will then serve as hostesses and ambassadors for the fair. 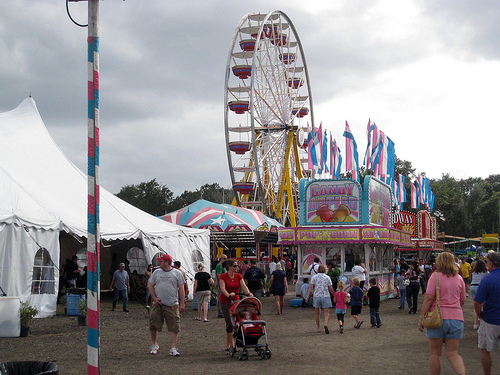 The fair hosts many events designed to raise funds for scholarships. Among those are the Florida Nursery, Growers and Landscape Association (FNGLA) auction held on Saturday, October 15. Purchase top quality plants donated by area growers. All proceeds go to the Youth Scholarship Fund. The Harvest Awards Banquet will be held Tuesday, October 11, on the fairgrounds. Five awards will be presented – Hillsborough County Farmer of the Year, Agribusiness of the Year, Urban Agriculturalist of the Year, Outstanding Public and Community Service and the Lifetime Achievement Award. Nominations are accepted through Monday, September 19. Located east of Brandon at S.R. 60 and Sydney-Washer Rd., admission is $7 for adults, $5 for students, $4 for seniors and free for children under 5 years old. Parking is free. For more information, including daily schedules, visit www.hillsboroughcountyfair.com. The fair office phone number is 737-FAIR. More information is available on Facebook as well.